I have a special drawer that I just throw stuff I want to keep in. It’s filled with letters, postcards, ephemera – just all sorts of stuff that has more sentimental value than actual worth. On gloomy rainy days, I often get out the box and look through it. It was on one such day that I discovered an old postacard that I bought at a flea market in Paris. The flowers on the postcard caught my eye and the color palette was so gorgeous. It was this card that inspired these flowers. My family smirks and calls me the Trash Princess, because I love to upcycle trash and bring out it’s “treasure”. Using soda cans seemed like the perfect material. They’re easy to find – FREE is good! and they’re easy to work with. Just be careful as sometimes the metal can get kinda sharp. Enjoy today’s video and remember it’s easy to turn your trash to treasure! Cut 6 petals from soda cans using the #3 heart (with #1 being the smallest), 5 petals from the #2 heart and one flower from Jewels Flower and Flourishes with the Artisan X-plorer™ machine. Bend sides towards center to give a little more shape to the flowers. 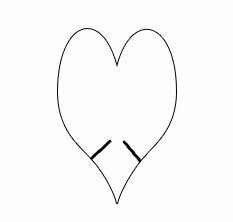 Place two tacky dots together and arrange larger hearts clockwise to form large flower. Repeat same process with smaller hearts. Arrange flower petals into a pleasing form and shape if necessary. Attach smaller flower to inside of larger flower with 2 part epoxy glue. Attach jewel flower to inside of smaller flower with 2 part epoxy glue. 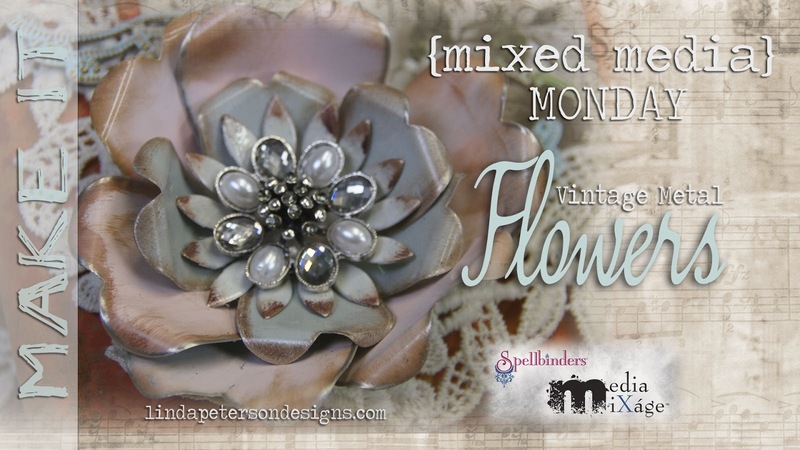 Glue brooch to center of flower with 2-part epoxy. Your creativity is limitless – Explore Beyond™! Mixed Media Monday – VIDEO – Take a day away from STRESS and visit my HAPPY PLACE! ….but now on with the story…. I was at BlackBerry Creek B&B in Rogersville, MO attending our girls creative retreat weekend when I first designed this canvas. I can get lost for hours just playing with paints and texture. It’s a real respite from life’s little challenges. For me, it’s about discovery, not following a recipe, not purchasing a lot of pre-made embellishments, I prefer to create my own, not follow any rules and get down right messy. The possibilities that the die templates give you in creating your own foam stamps is beyond amazing and fits right in with my “make it yourself” philosophy. 3. Carefully remove lattice pattern leaving the small squares attached to the packing tape. 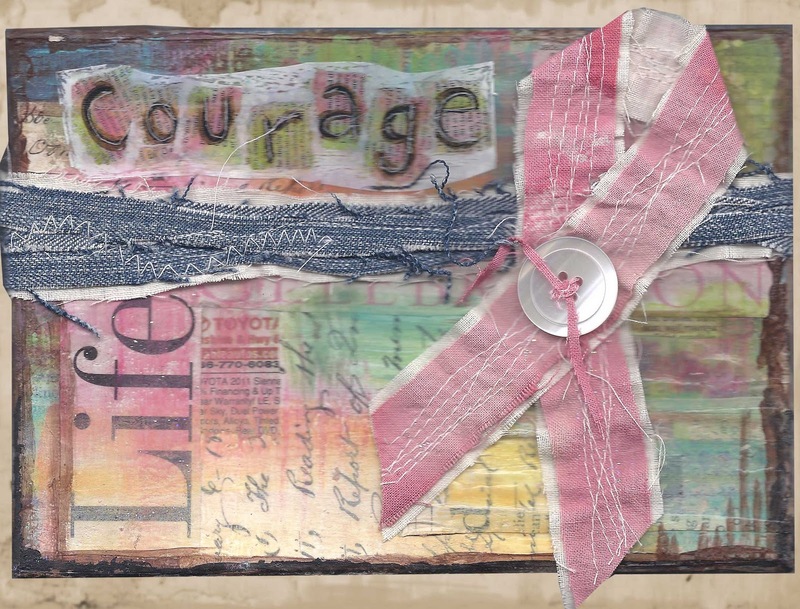 Decoupage sheet music, dictionary pages and other decorative papers to front of canvas. Let dry. Apply paint to wax paper. Load paint randomly onto brayer. Hit and miss over different areas of the canvas. Repeat with coordinating colors. Allow paint to dry in between each color so that they don’t muddy together. Add touches of paint with your fingers or a brush randomly over the canvas. Selectively wipe away some of the paint in random areas allowing portions of the background paper to show through. Cut a heart out of music sheet paper and decoupage onto front of canvas over background patterns. Water down paint and lightly paint over top with a coordinating color. 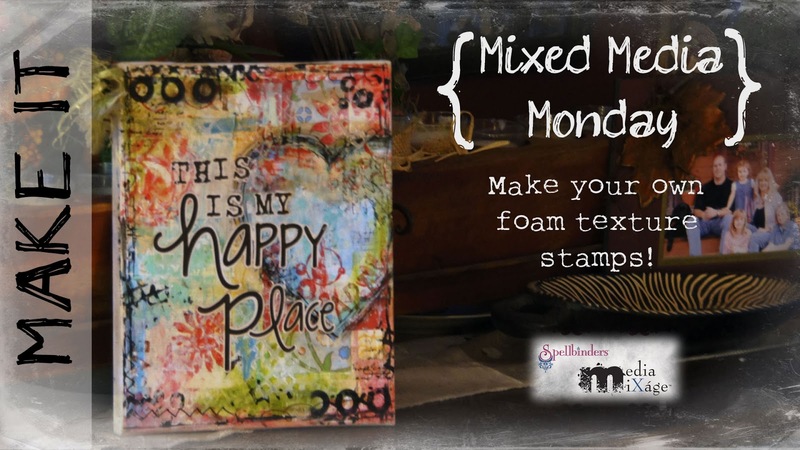 Apply paint to foam stamps with brayer. Repeat step 6 except this time use the circles stamp. For this particular pattern I used black permanent ink. When your background has been completed, cut out words from paper and decoupage to front. Jump up and down because YOU DID IT! – You now have a certified HAPPY PLACE! You can’t make a mistake! Baby wipes will take away paint in unwanted areas and are really handy to have when creating canvases. If you are totally dissatisfied with your results, you can wipe away most of the paint with a baby wipe or simply decoupage more paper over the areas you don’t like and work from there. I have mentioned the above dies because they are among my favorite shapes to work with when I create mixed media canvases. EXPLORE BEYOND my suggestions and mix and match dies that you have in your collection to come up with your own unique stamps. These stamps can be used with cardmaking, art journal pages and because they are flexible they are ideal to stamp curved projects – like paint cans, candles and more! Don’t miss out! Subscribe to my free project tutorials, videos and tips to help you in your creative home and business life!